Twelve days left to get 18,000 additional signatures! If you share this petition we can reach our goal! This Petition will close at the end of 2018 and will be hand delivered to the Mayor of Charleston, South Carolina. The Wagon Companies always have a weak excuse, but the public and tourists are finally seeing the reality of life as an enslaved Wagon Horse in a crowded city. Please sign and share and help stop the Wagon companies from animal abuse and bullying the Animal Rights Advocates. There are several alternatives for touring the city. No one wants to see these companies go out of business, but it would be nice to see a positive change in their practices. Thousands of people from all over the world are asking for your help! We need to take a serious look at the current Carriage business in Charleston. The system is broken and inhumane!. Charleston & Savannah have joined together to form one voice for the horses on our streets. It's no longer a romantic, genteel way to see our beautiful city, it's a disgrace. Three more days. Please share. Twelve days remaining in this year and 18,000 more signatures needed. If you share this and ask two people to sign we can make our goal. This is the last chance these horses have with this Petition. It's time for us to take it to the Mayor! The clock is ticking, please share far and wide! 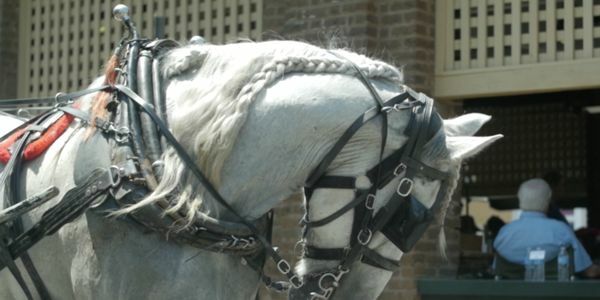 We need 19,000 additional signatures to reach our goal of a Quarter of a Million people asking for a ban on cruel and inhumane Carriage rides. This Petition will close at the end of 2018 and we want to be heard loud and clear when we hand deliver the printed signatures to Mayor John Tecklenburg in January 2019. Sharing this petition with family and friends is crucial now. Your support is the driving force behind this movement! Thank you for giving it such power! We have news! Charleston, SC & Savannah, GA have joined forces! Our two cities will be one voice for the horses working on our streets. Be a part of this joint effort to make a positive change. Share our news. Signatures are powerful! Charleston Carriage Horse Advocates on Facebook, and ccha.join on Instagram are asking for an Independent review of the Charleston Carriage horse companies. Please like and share. We can make a real difference for these horses! Other cities will follow if we make a good example. Thank you! !